Panasonic TX-55FZ952B review | What Hi-Fi? This new OLED stands right up there with the best around. After Panasonic’s TX-55FZ802 received a five-star review, the spotlight now turns to its slightly more expensive sibling, the TX-55FZ952B. What you get for an extra £200 is an integrated soundbar tuned by Technics, and two premium remote controls rather than a single, plastic clicker. In terms of picture quality the two TVs share identical specification, which makes the FZ952 a very accomplished performer. Add an integrated sound solution that makes a big difference to sound quality, and the extra outlay over the FZ802 already seems like money well spent. The FZ952 pretty much looks like the FZ802 standing on a soundbar - but the Technics-tuned speaker array is slimmer, more angular and generally sleeker than the description 'soundbar' might imply. 'Soundblade' might be a better way to describe it. It integrates neatly into the pedestal stand, and is almost as wide as the screen itself. That gives the TV a large footprint, so you’ll need to ensure the furniture you place it on is wide enough. When wall-mounted, the speaker section mounts flat against the wall underneath, making for a neater appearance. Everything about the design speaks of subtlety and sophistication. The bezel is very thin and, other than a couple of small logos, the set is entirely black. In a darkened room, it all-but disappears. Thanks to the OLED tech, the majority of the panel is super-thin. But the plastic protrusion housing the connections (and processing bits and pieces) means it’s not quite as skinny all over. The TX-55FZ952B’s picture is more or less identical to that of the TX-55FZ802B, which means it’s absolutely lovely. Last year’s Panasonic OLEDs were lacking in brightness, and so struggled to make the most of HDR content. That’s not the case here. Play Fantastic Beasts and Where to Find Them on 4K Blu-ray and there’s real punch to proceedings, with the magic effects leaping off the screen. Combine this new-found brightness with OLED’s trademark pure blacks, and you’ve got exciting contrast levels. An LCD TV with a direct backlight will, of course, go brighter still - but for an OLED this is a dynamic image. Colours are superb too, blending vibrancy with realism - so you get a beautifully vivid reproduction of the creature zoo contained in Newt’s suitcase as well as supremely subtle, natural skin tones for all of the human characters. This balance and consistency is the Panasonic’s greatest strength. It’s an exciting performer, but it’s also effortlessly controlled and never gives the impression it’s delivering anything other than what was intended. Nothing stands out or draws the eye in a negative way. Having said that, LG’s 2018 OLEDs (C8 upwards), with which this Panasonic shares its panel, generally take things a bit further. It adds a touch of extra brightness, vibrancy and sharpness to the already-tasty recipe. The extra sharpness is the biggest deal, as it results in a more three-dimensional image. 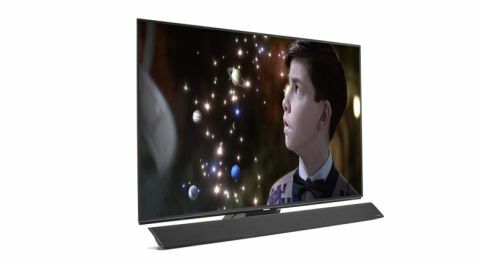 Next to the LG OLED55C8PLA (£2500), the FZ952’s picture is just a little flat. Panasonic has done a good job with its motion processing, though, arguably overtaking LG in that regard. Set the 'Intelligent Frame Creation' to 'Minimum' and you’ll get a bit of sharpening and smoothing with none of the dreaded ‘soap opera’ effect. The FZ952 is also an accomplished upscaler of 1080p, and even standard-definition, content - while deft colour-handling ensuring the lower-quality images have punch to them yet remain realistic. The success here is also down to the clarity and cleanliness with which this TV reproduces the lower-resolution inputs. It makes watching standard-def content, in particular, far less of a chore than it might otherwise be. But the FZ952’s real point of differentiation is its soundbar. Tuned by Panasonic’s sister brand, Technics, we had high hopes for the neatly integrated array and are pleased to discover this is one of the best integrated TV sound solutions we've heard. It’s a punchy, weighty, dynamic and detailed listen, and it’s far more able to do justice to an action scene than the vast majority of TVs. It also balances directness and spaciousness well, so it’s engaging and also atmospheric. There are better soundbars, of course – the Dali Kubik, for example. But for an integrated solution, particularly one commanding a premium of just £200, it’s very good indeed. We think anyone spending over £2000 on a TV should also budget for a separate sound solution. But if you’re determined to use an integrated speaker, this is as good as it currently available to you. After a disappointing 2017, the FZ952 and its sibling the FZ802 prove Panasonic is back and mixing it with the best. This is a consummate performer, one that’s natural and consistent across the board while also adding the punch and dynamism missing from last year's Panasonics. And what’s more, the FZ952 boasts one of the best integrated sound solutions currently available. That it commands just a £200 premium over the FZ802 makes it something of a no-brainer – the Technics-tuned speaker system sounds more expensive than that. Just make sure you audition the LG C8 before parting with your cash.